Clark and Lana embrace, kissing each other passionately.�Suddenly, Clark tells Lana to wait.�Lana argues with him.�She wants this.�They don't have to go back as long as they have each other.�Clark struggles for a moment, and then tells Lana he wants her to remember. Atop a building, Traci hugs her father warmly, overjoyed to have finally found him.�He tells her that he was able to find her, because he could smell the filthy magic she was using.�Traci slowly backs away in shock, to find a heartbreaker firmly attached to her father's chest.�In a rage he pushes her down, and screams at her.�It was that magic that took her mother from him.�Traci tries to tell him that he needs help, but he just pulls his knife slowly. Years ago, in Smallville.�Clark and Lana sit studying up in their barn.�Clark leans in to wipe a spot of food off of Lana's face, and the two gaze into each other's eyes for a moment before sharing their first kiss. Back in Hell's Heart,Clark tells Lana to remember their first kiss; to remember how it felt.�Lana says that it was bright and good, and it made her feel invincible.�With a shriek, the heartbreakers run from their hosts, leaving Clark and Lana.�Clark tells Lana what they are, and she says that she feels good again. Traci evades her father as he moves in for the kill.�He dares her to kill him, when suddenly Clark and Lana appear on the scene.�Clark asks what it was like the first time he saw his wife hold his daughter.�Traci's father doubles over in pain but Clark delves deeper, pulling up old happy memories.�Suddenly, her father straightens up, and is free of possession.�Traci helps her father up.�Lana turns to Clark, and catches him looking out over Hell's Heart. Clark moves down into the streets, and is soon surrounded by people.�One man steps forward and tells Clark that he doesn't belong there.�Clark says that he just wants to help.�Then, straightening up, he tells them that if they have no magic in their lives then he will give them some of his. Clark spreads his arms and slowly rises into the sky.�All around him, heartbreakers fizzle away into nothingness as the men around him believe that a man can fly.�As he heads off into the sky, Superman tells them that they are not forgotten, and that he'll be back. In the days to come, Superman works to change Hell's Heart for the better. Clark meets with Pete in the White House.�Pete thanks him for bringing Lana back to him, and then tells Clark that she told him what happened out there.�Clark tells him that he loves them both, and then in a quiet voice he asks if Lana and Pete are going to make it.�Pete just stands there quietly for a moment, before telling Clark that since they came back Lana has been more alive and stronger than she has been for years.�He doesn't know what it means, but he knows it is good for Lana. In Hell's Heart, a group of people look skyward incredulously, not believing it will really happen.�Then Superman appears in the sky, carrying down a huge Christmas tree for the people of Hell's Heart. Story - 4: I thought this was a very fitting ending to a very good storyline.�Clark stands up to his fears and inhibitions and triumphs over them.�But what really sold the issue for me was Clark telling the people to have some of his magic as he rises into the air above them.�Far too often, the comics down play the fact that Superman inspires people.�We see him around people that know him and aren't at all impressed by his powers anymore, but here we see him using his powers to inspire and to give hope. Every now and then the writers try a human approach to Superman, where he has to help people fight poverty and drugs and other problems that you can't just defeat with super-strength.�Normally the stories fall sort of flat, but by this one maintained its power all of the way through.�It was great to see Clark take a role, instead of just flying in as Superman. I did have a few minor issues with the story, but nothing too big.�Lana calls him Clark in front of others, something she really should know not to do, and I really don't like the way they are writing Pete and Lana's relationship.�When they got married back in 1994, Pete and Lana really loved each other.�Sure, Lana might have wondered about Clark, but she didn't just settle for her husband.�And in all of this, where is baby Clark?�Therefore, a minus one, but overall it was a great ending to a terrific and different story. Art - 4: I like Ferry's work a lot.�It's very bold and clean.�His flashback sequences with Clark and Lana looked especially good.�I thought a couple of pages looked a little messy, and I'm sure this was do to one of the three inkers.�I'm not sure why they needed to use three inkers on one story, and for the inconsistency it gets a four, but otherwise really good art. 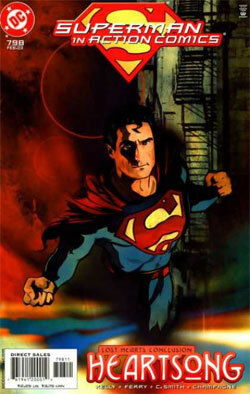 Cover Art - 4: I'm still not completely sold on these covers, probably because I just don't like the way Superman's face looks, both in this one and the first one of the series.�However, the coloring effect works wonders.�The derelict-looking buildings behind him were perfectly done, and the splash of color at the bottom really adds something as well.�Plus, no stupid logo.�And what's on the cover actually happens in the story.�Superman is flying above Hell's Heart on the cover, and he flies above it inside.�A little plain, but with this story I think it works.